Bring your love of wildlife and the outdoors into focus in your garden using the Gardman Aged Bronze Nature Garden Trellis. Adding a trellis to your garden lends height and drama to it, and this intricate piece will also offer style. Round, 0.25" diameter metal rods form the frame, housing three-dimensional bird, twig, and leaf shapes within it. Its raised arch lends exciting height to this unit, while a scrolling detail in the center offers contrast and a design element. The aged brown color throughout the piece meshes perfectly with your plants, while a few gray and black sections add visual interest. The two pointed legs insert into soil in moments, for a quick and simple installation, and the all metal construction forms a lasting piece. 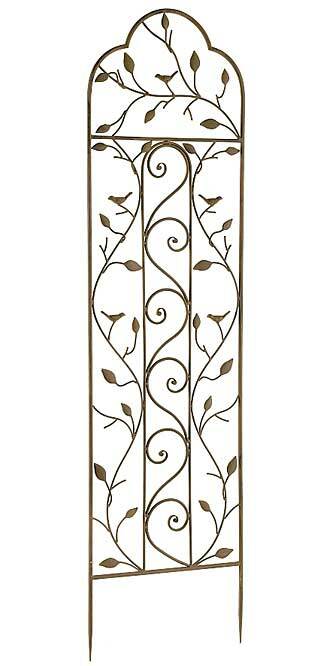 Enjoy birds and the natural world in a fun way with this Aged Bronze Nature Garden Trellis.